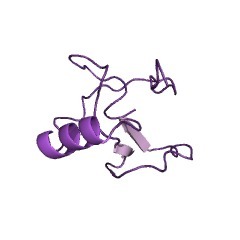 This domain is found in the MbtH protein as well as at the N-terminus of the antibiotic synthesis protein NIKP1. 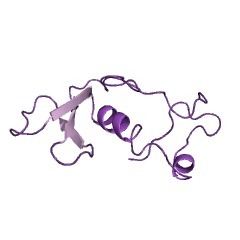 This domain is about 70 amino acids long and contains 3 fully conserved tryptophan residues. Many of the members of this family are found in known antibiotic synthesis gene clusters. 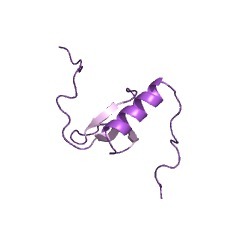 This domain is found in the MbtH protein O05821 as well as at the N terminus of the antibiotic synthesis protein NIKP1. 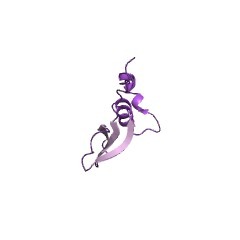 This domain is about 70 amino acids long and contains 3 fully conserved tryptophan residues. Many of the members of this family are found in known antibiotic synthesis gene clusters. There are 6235 MbtH domains in 6234 proteins in SMART's nrdb database. Taxonomic distribution of proteins containing MbtH domain. This tree includes only several representative species. The complete taxonomic breakdown of all proteins with MbtH domain is also avaliable. Click on the protein counts, or double click on taxonomic names to display all proteins containing MbtH domain in the selected taxonomic class. 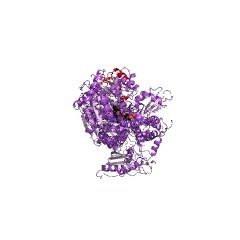 The 1.8 A crystal structure of PA2412, an MbtH-like protein from thepyoverdine cluster of Pseudomonas aeruginosa. Many bacteria use nonribosomal peptide synthetase (NRPS) proteins toproduce peptide antibiotics and siderophores. The catalytic domains of theNRPS proteins are usually linked in large multidomain proteins. Often,additional proteins are coexpressed with NRPS proteins that modify theNRPS peptide products, ensure the availability of substrate buildingblocks, or play a role in the import or export of the NRPS product. 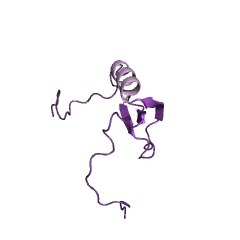 ManyNRPS clusters include a small protein of approximately 80 amino acids withhomology to the MbtH protein of mycobactin synthesis in Mycobacteriatuberculosis; no function has been assigned to these proteins. Pseudomonasaeruginosa utilizes an NRPS cluster to synthesize the siderophorepyoverdine. The pyoverdine peptide contains a dihydroxyquinoline-basedchromophore, as well as two formyl-N-hydroxyornithine residues, which areinvolved in iron binding. 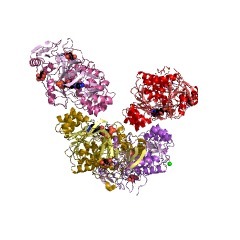 The pyoverdine cluster contains four modularNRPS enzymes and 10-15 additional proteins that are essential forpyoverdine production. Coexpressed with the pyoverdine synthetic enzymesis a 72-amino acid MbtH-like family member designated PA2412. We havedetermined the three-dimensional structure of the PA2412 protein anddescribe here the structure and the location of conserved regions.Additionally, we have further analyzed a deletion mutant of the PA2412protein for growth and pyoverdine production. Our results demonstrate thatPA2412 is necessary for the production or secretion of pyoverdine atnormal levels. The PA2412 deletion strain is able to use exogenouslyproduced pyoverdine, showing that there is no defect in the uptake orutilization of the iron-pyoverdine complex. 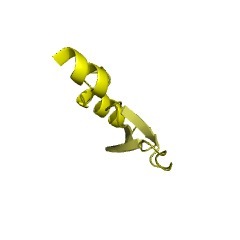 2gpf Solution NMR Structure of Protein PA22412 from Pseudomonas aeruginosa. Northeast Structural Genomics Consortium Target PaT86, Ontario Centre for Structural Proteomics Target PA2412.